Who do you align yourself with? Yesterday, James was discussing favoritism and today he continues by describing it in more detail and then asking why people are aligning themselves with people who are not believers. Read James 2:5-7. 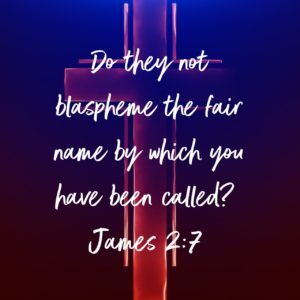 Do they not blaspheme the fair name by which you have been called? Trying to get on people’s good sides, just for what they can give you, is wrong. The people were sacrificing their principles just to gain posessions and material things. As they were trying to gain the favor of these people, they were aligning themselves with people who don’t believe in Christ, and in some cases were actively trying to get rid of Christianity. What about us today? Have we compromised our beliefs just to entice people to come to church, or to give money, or to elect us to positions of power? If we allow them, others will dictate to us what to believe and how we should act on that instead of being led by the Holy Spirit and the Word of God. What are we compromising today?